With the Super Bowl now less than two months away—Groundhog Day!—the disparate mass transit organizations around New York City are gearing up for more than 400,000 new visitors. And what do out of towners always need in New York? They need maps. Beautiful, useful maps. For the first time ever, the Metropolitan Transit Authority is releasing a regional transit map that covers everywhere from Newark, New Jersey, to downtown Manhattan—including, of course, the MetLife Stadium in the Meadowlands, where the big game is set to take place. The map brings together lines not only from the New York City subway but also New Jersey Transit, Metro-North, PATH, Long Island Railroad, and Amtrak. Now you can see why the MTA is calling this "the first mass transit Super Bowl." Besides being useful, the map is also interesting from a design point of view. 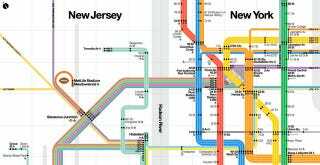 As Quartz's Zach Seward points out, it bears a striking resemblance to Massimo Vignelli's controversial and eventually discarded subway map from 1972. In fact, this should come as no surprise, considering that Vignelli Associates—the designer's firm—put this new one together. Vignelli's original map favored form and function over geography, stacking up all of the subway lines in an orderly fashion and putting intersections at 90-degree angles. This did away with the majority of the city's geographic features. It was a diagram more than a map, in other words, and the same could be said for today's Super Bowl version.